It’s time for the second announcement of CodeSandbox! 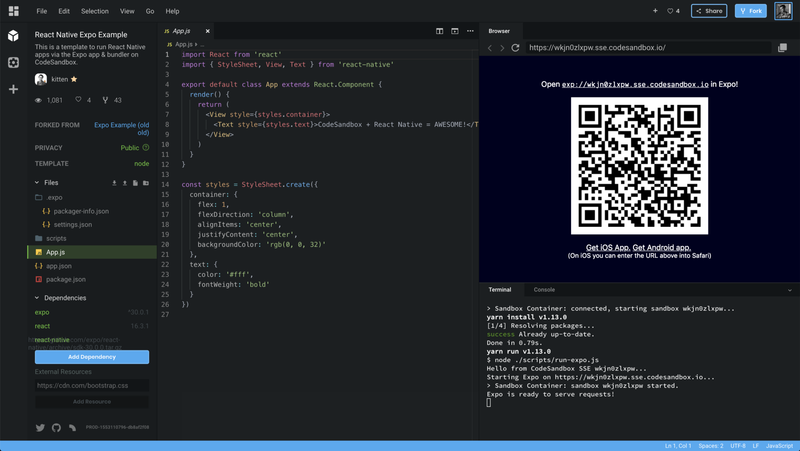 In September we made the announcement of CodeSandbox Containers, with containers we execute the code you write on a server instead of in the browser. This allows you to run almost anything you want on CodeSandbox, just like a local development environment. When we announced this we gave the functionality the “beta” tag, we wanted to test it more before we would mark it as stable. During this time, we flawlessly ran more than 23,000 container sandboxes, while considering users’ feedback, and iterating on the feature. It wasn’t all rainbow and unicorns, though, we had a few (expected) glitches along the way. So we worked hard on improving both the infrastructure and the implementation, and we’re quite confident to mark this feature as stable beginning today! We saw many new kinds of projects on CodeSandbox as soon as we released containers, we want to highlight some of the craziest and best ideas built on CodeSandbox. Phil Plückthun created a sandbox that runs Expo! This way you can build React Native apps directly on CodeSandbox. 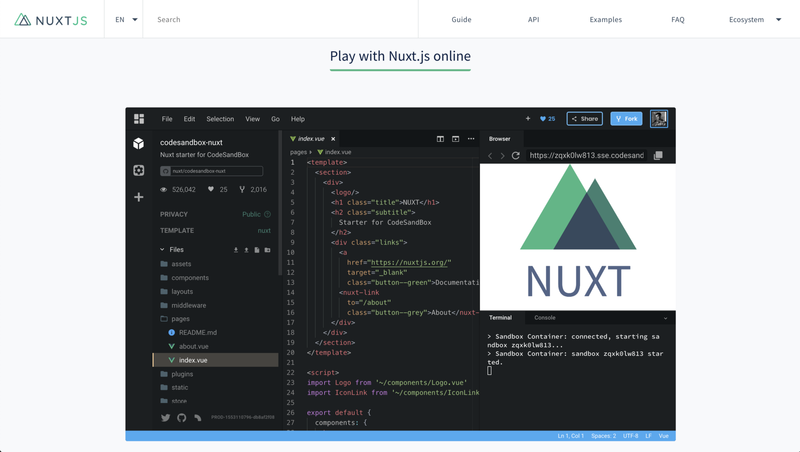 One of the best examples we can give you for the stability of containers is the homepage for https://nuxtjs.org/ as they have been running them from almost the start and have been integral in testing the resilience of our containers. This is their starter example. Containers have also been used a lot by Next.js, Gatsby and Apollo for their documentation and examples. They have set up GitHub repositories that link to sandboxes to showcase how their frameworks work. If you’re interested in setting this up for your framework, don’t hesitate to shoot us an email to hello@codesandbox.io! Here is a Gatsby, Next.js and Apollo example. Another cool example is the node video streaming demo, showcased here. It shows how you can stream videos using Express. We’ve been doing many improvements since the initial release. Here are the highlights of what we built and improved. Last week we moved our sandbox containers over to a new infrastructure, which resulted in a big speed improvement for our containers. We upgraded the storage nodes to NVMe drives, we are using a new Kubernetes version (1.13.4) and added more servers to run the sandboxes in. As a result, we also increased the time of inactivity to hibernation to 60 minutes instead of 10 minutes. A detailed post about infrastructure, architecture and software stack is coming soon! Up until now we you were able to create up to a maximum of 5 container sandboxes as regular user, and you had a limit of 20 sandboxes as a patron. Today, as we mark the service as stable, we are increasing the maximum number of container sandboxes to 15 for anyone and 30 for patrons. We may raise the limits based on usage in the future. Another change we made is that from this moment on any sandbox that is in the “Trash” folder does not count towards this sandbox limit. This also applies for the 50 sandbox limit on client sandboxes. You can now add environment variables to a container. The variables will be hidden for others and will not persist between forks. This is perfect for showing demos/examples of APIs without exposing any secrets. 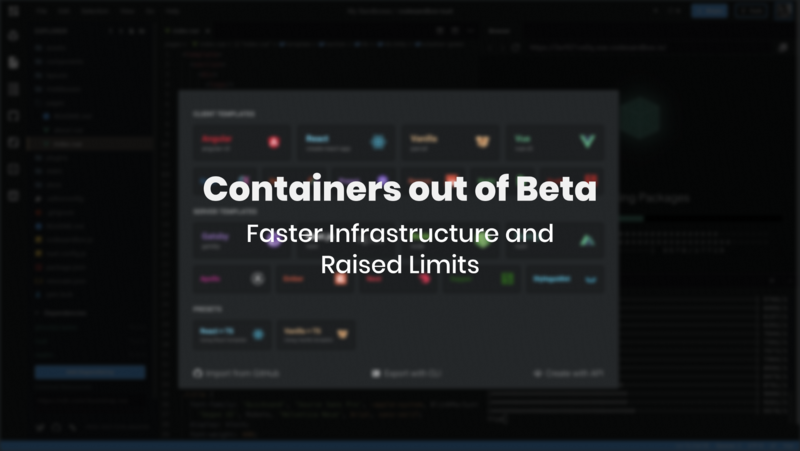 We have big plans for how our containers will work in the future, we want to give anyone access to a docker instance with the click of a button. We want to make some additional features and changes to make this easier. Sometimes containers get stuck and that’s not nice at all. One way we want to mitigate this is by adding a “Restart Container” button that will restart your docker container. We often saw that people started working on a browser sandbox, but then outgrew its size after a while. Maybe because you want to access the terminal or because you want a helpful command line to help you generate the files. This is a big pain-point for a lot of our users, particularly in angular, so we will make it possible to convert any sandbox to a container sandbox in a click of a button. 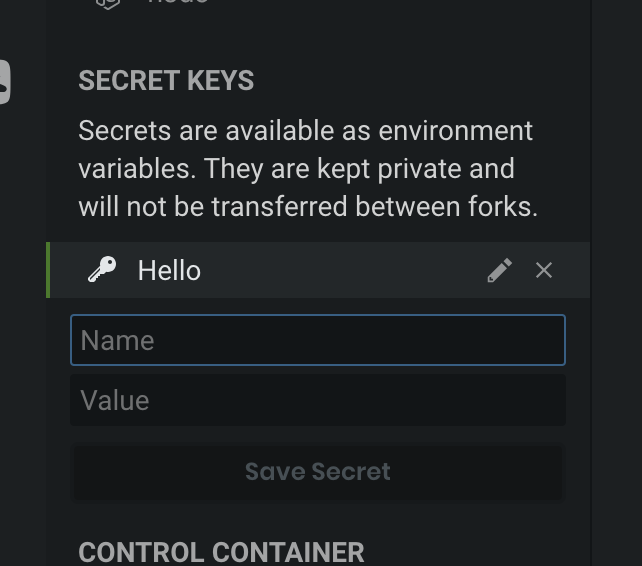 When you click the button we will create a fork of the sandbox backed by a container, so you can install and run whatever you run on your local machine. What if you could use your sandbox as a really simple API? That’s our idea too! One thing we plan to implement now that the containers are stable is a way for the sandbox to wake up as a request is done so that you can get a proper API response from a container sandbox at any time. This will make it much easier to actually build APIs and bots using CodeSandbox! Sometimes you create a server sandbox that you want to run forever, right now this is not possible since we will “hibernate” this sandbox after a while. This is also something we plan to add as a feature so that if you have a container sandbox embedded in the documentation, this sandbox will never be stopped. 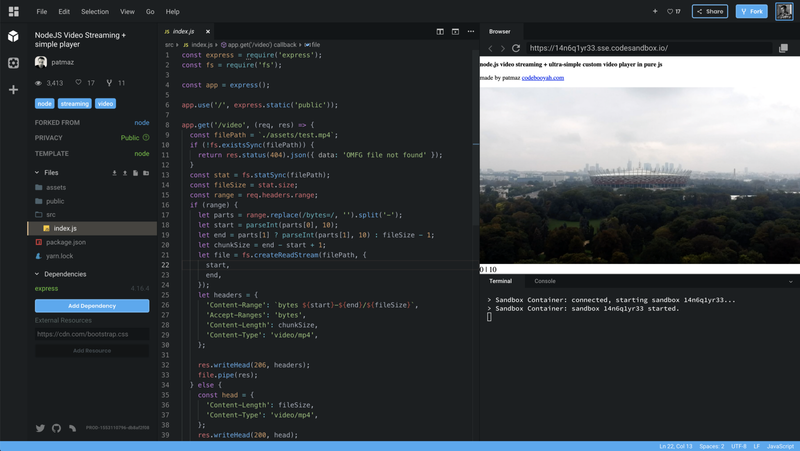 This has been in the works for a while and it was a real strive for us to complete and honestly could not be done without the amazing work that Bogdan puts into making CodeSandbox better and faster every day. We hope you love this update as much as we do, and to anyone who has been with us since the beginning of containers, thank you for making it better with your feedback and suggestions!